The First Judicial District Commission on Judicial Performance unanimously recommends that Judge Susan L. Fisch BE RETAINED. Judge Fisch was appointed to the Jefferson County Court in 2008. Prior to her appointment, Judge Fisch was a state public defender for twenty years and then a federal public defender. She attended the University of Denver for both her undergraduate education and her law degree. Currently, she trains new judges statewide and teaches at the National Institute for Trial Advocacy. Judge Fisch is also on the Supreme Court Criminal Rules Committee, where she is working to try to eliminate incarceration when people fail to pay fines. This practice has already been eliminated in Jefferson County. 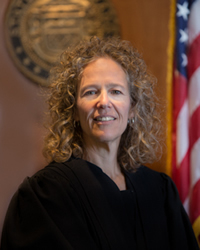 Judge Fisch received stellar reviews in her surveys from attorneys and non-attorneys. All of her scores were well above the average scores for Jefferson County judges being evaluated during this retention cycle. Of all attorneys responding to the survey, 85% recommended to retain, 7% not to retain, and 8% made no recommendation regarding retention. Of non-attorneys responding to the survey, 93% recommended to retain, 5% not to retain, and 3% made no recommendation regarding retention. (These percentages may not add up to 100% due to rounding.) In the surveys, attorneys often complemented her demeanor, knowledge of the law and ability to listen. When asked about Judge Fisch’s weaknesses, many attorneys observed that she has none. In her interview Judge Fisch explained that as a public defender she stood right next to many clients when they appeared before a judge. That experience has helped her to understand how nervous, scared or intimidated people can be when appearing in court. She tries to adopt a demeanor and communication style that help people appearing in her courtroom feel more at ease. She acknowledges the importance of making sure that all the people in the courtroom feel at ease, not just those addressing the court. Judge Fisch is currently the Presiding Judge at the County Court level. She finds this role to be challenging because it involves bringing people together who have very different views. As the Presiding Judge, Judge Fisch resolves personnel, inter-department and judicial matters. She also works with outside agencies, such as the Public Defender, District Attorney and Sheriff’s Department to resolve issues on a regular basis. The District Attorney and Public Defender both find Judge Fisch to be an excellent Judge. The Commission is impressed with Judge Fisch’s scores and work outside of the courtroom. Based on these findings, the Commission unanimously recommends that Judge Fisch BE RETAINED.